Doing the business on the family business. That old Irish saying warns that you can fool yourself into believing you’re in gravy, until Reality mops the floor with you. Walking a fine line between pulp noir and terrifying reality, BEFORE THE DEVIL KNOWS YOU’RE DEAD succeeds on its tortured performances, each character in this quirky crime drama harboring a soul-crushing burden, each actor sweating that burden into the fabric of their performance. It would be cloyingly cliché if it weren’t for Hoffman and Hawke acting the snot out of this beargarden. I’m not giving away any twists that the DVD box doesn’t. The body of the movie concerns itself with how everything gets pear-shaped once the robbery is botched by Hank. To make matters steamier, Gina is nutcracking Hank with her whip-tight bod, behind Andy’s back. In a movie about betrayal, this comes as no surprise – except to Andy when she confesses. 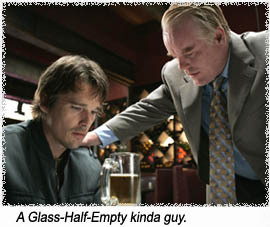 And that only makes Philip Seymour Hoffman act even better. Legendary director, Sidney Lumet, and first-time writer, Kelly Masterson, weave this desperate tale out of chronological order, but in a creative way: two characters would play out a scene in a kitchen, while we see glances of two other characters outside the window. Later in the film, we would be privy to the scene outside the window, while glances of the two characters in the kitchen tells us we are back at the same moment from another point of view. Lumet is a legend for classics like 12 ANGRY MEN (1957) and SERPICO (1973), but his post-90s output is shaky (A STRANGER AMONG US, 1992, and GLORIA, 1999 – yeccch!). This is one of his good ones. At 83 – he’s back! Hawke eventually slides into that space he finds so comfortable – the flustered sidekick – while Hoffman’s acting skyrockets into nuanced madness. Albert Finney effectively simulates a man whose brain explodes when he discovers what his two sons have done to the family; while Marisa Tomei walks around extremely naked for the benefit of pudding hands everywhere. Starring: Philip Seymour Hoffman, Ethan Hawke, Albert Finney, Marisa Tomei, Aleksa Palladino, Michael Shannon, Rosemary Harris.